Since cake is easier to work with than brownie I made the body and head out of cake. The legs and arms are made out of chocolate brownie. 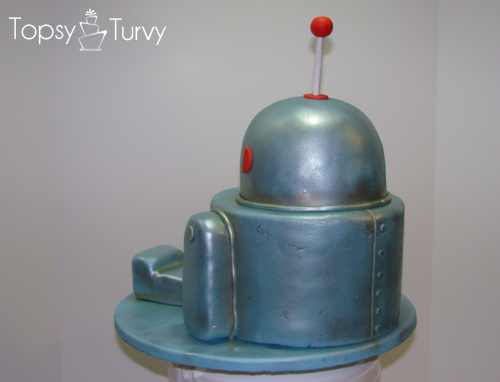 The best part of the cake (in my opinion) is the silver and gold airbrushing… It takes the cake from just cute to awesome! Thanks! I love coming up with a new cake, it’s so rewarding when people like it! So thank you! Thank you so much! I love creating a new fun cake! What a work of art!! You really had to put a lot of time and thought into it, and of course creativity. Thanks so much! I love making cakes, it’s so fun to come up with a new design in a different way. Glad I don’t have to repeat designs! kind of… I’m a mom, that’s what I do for a job. BUT I do sell cakes on the side. Not very often because my kids come first, but I do enjoy the occasional cake. I mostly do it for friends and family these days. Thank you so much for the compliment! I really do enjoy making them! I so wish I had found you a few months ago for my boys birthday. 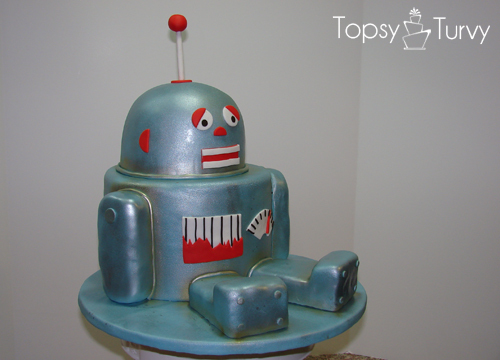 He is a huge robot fan and he would of loved this cake. It is so adorable. I would love it if you could link this up to our linky party going on right now. Thank you so much. I’m glad you liked it. Add it to the list for future parties! My oldest has her next 5 birthday ideas planned out~! Terrific as usual – love the shiny silver! I’ve featured this today at the Craftastic Link Party. Thanks for linking up last week!